Nearly a week after the Director General of Military Operations (DGMOs) of India and Pakistan agreed to implement the ceasefire pact of 2003 in “letter and spirit”, Pakistani rangers resorted to unprovoked and indiscriminate firing along the IB here on Sunday morning killing two BSF personnel , including an officer, and injuring 14 civilians in Akhnoor, Kanachak and Khour sectors of Jammu. The firing from across the International Border (IB) in the Pragwal area of Akhnoor sector started in the wee hours, resulting in critical injuries to two BSF personnel manning a forward post. 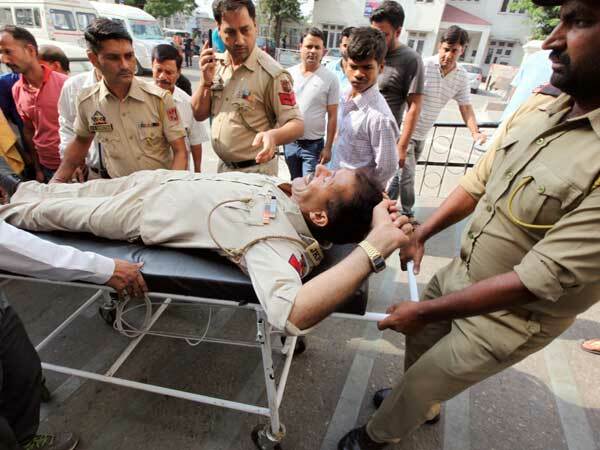 Assistant Sub-inspector Satya Narayan Yadav and Constable Vijay Kumar Pandey — both residents of Uttar Pradesh — later succumbed to injuries at a hospital while undergoing treatment. The firing from across the border in violation of the ceasefire agreement prompted a strong and effective retaliation, a BSF officer said. Cross-border firing was going on when last reports came in, he added. On May 29, the DGMOs of India and Pakistan agreed to “fully implement” the ceasefire pact of 2003 in “letter and spirit” forthwith to stop border skirmishes in J&K. The two military commanders reviewed the prevailing situation along the LoC and the IB in J&K during a conversation over the special hotline. The hotline contact was initiated by the Pakistani DGMO. Awtar said the BSF was strictly implementing the decision taken at the DGMO level by the two countries last week. Suddenly, Pakistan started firing around 1.15 am, injuring two of our personnel who later succumbed. It was targeted firing on forward duty points by Pakistan, he added. We have strongly responded and in the coming days we will come to know about the damage suffered by Pakistan in the retaliatory action, he said. The IG said the BSF did not target civilian locations but Pakistani forces did. We only targeted the locations that targeted us but Pakistan, on the other hand, started targeting civilian areas of Pragwal and Kanachak since wee hours resulting in civilian casualties and damage to civil property, he said. He also ruled out that sniping or an attack by enemy personnel wearing ‘thermal camouflage suits’ led to the two casualties on the International Border (IB). “There is a need to study this case thoroughly. After every incident we do a detailed study and accordingly take precautionary measures for the future. This incident of cross-border firing will be probed as well,” the BSF IG said. The latest deaths in the Pakistani firing raised the casualty figure during ceasefire violations along the IB and the Line of Control (LoC) in the state to 46. The dead includes 20 security personnel. Last month, thousands of people residing along the IB in Jammu, Kathua and Samba districts had to flee their homes following intense shelling from Pakistan between May 15 and May 23 which left 12 people dead, including two BSF jawans and an infant, and scores of others injured. After the DGMOs of the two countries spoke to each other, hope rekindled among border residents who had started returning to their homes but the latest incident would trigger fresh concerns among them.